Some cats are more sensitive than others to chrysanthemums. The chrysanthemum is the traditional garden flower to brighten up fall landscapes. Certain species are also a natural source of insecticide. Your cat might be curious about anything new in your – or her – garden, so be aware of possible toxic reactions. Pyrethrin is a botanical insecticide found naturally in several species of chrysanthemum. It kills insects by attacking the nervous system and paralyzing them. Pyrethrins also inhibit insects from biting and are used in insect repellants, including many commercial flea and tick products. Pyrethrins are generally considered to be low in toxicity to cats and other mammals. However, cats are more sensitive than dogs because their liver metabolism pathways are less efficient and they have a greater surface area to body weight ratio than dogs and other mammals. Toxicity to pyrethroid, the synthetic form of pyrethrin, often presents when dog flea control products are applied to cats. The American Society for the Prevention of Cruelty to Animals lists chrysanthemums as toxic to cats, dogs and horses, if ingested in high enough amounts. Symptoms of toxicity include vomiting, diarrhea, hypersalivation, lack of coordination and dermatitis. Symptoms are seen within a couple hours in cats. Sensitive cats can exhibit dermatitis by just coming into contact with chrysanthemum. Always consult an experienced veterinarian regarding the health and treatment of your pet. If you suspect your cat has ingested chrysanthemums, contact your veterinarian, closest emergency vet clinic or the ASPCA poison control hotline at 888-426-4435 (you might be charged a consultation fee). Depending on the symptoms, your vet might induce vomiting or administer a bath. If you have a cat, the surest way to avoid exposure is to keep chrysanthemums out of your house and garden. 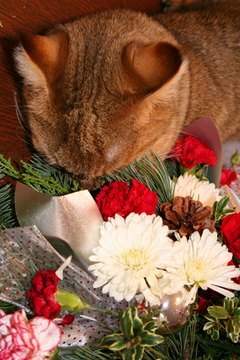 Are Carnations Poisonous to Cats?